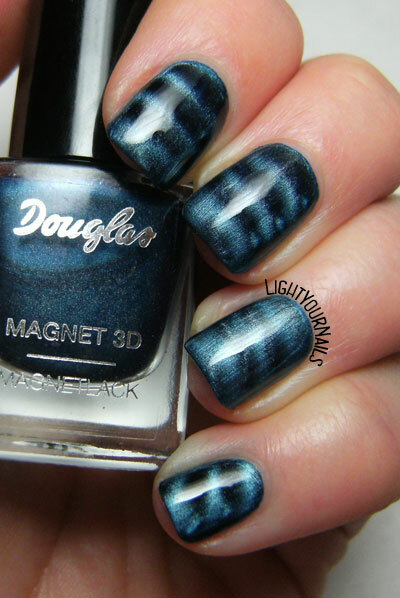 Douglas Magnet 3D: Blue Attraction | Light Your Nails! Today I have a quick swatch for you. It’s a nail polish I found in Douglas Advent’s calendar last month. Douglas is a German drugstore with shops in many European countries, including Italy. They also have their own make-up brand now. Douglas Blue Attraction is from their Magnet 3D collection which I’m pretty sure is already discontinued actually. Douglas nail polish now comes in a different bottle shape. Blue Attraction is a lovely blue shimmery nail polish that comes with a magnet ring around its bottle’s neck. It’s very pigmented and basically a one-coater. The magnet works really well and the magnetic effect is very quick to come up on the nails. My photos don’t pay it any justice, this polish looks gorgeous in person and all the lines are very clean and crisp. Oggi post veloce per mostrarvi uno smalto che ho trovato nel calendario dell’Avvento delle profumerie Douglas. Douglas Blue Attraction è uno smalto della collezione Magnet 3D, collezione che ormai non è più in vendita credo. La nuova linea di smalti Douglas ha anche una boccetta completamente diversa. Blue Attraction è uno smalto blu brillante con effetto magnetico. Il magnete è a forma di anello e si trova al collo della boccetta. Si tratta di uno smalto molto pigmentato, coprente già alla prima passata. Il magnete funziona benissimo e l’effetto magnetico appare subito sulle unghie. Le mie foto davvero non gli rendono giustizia, dal vivo questo smalto è bellissimo e le linee sono molto nitide. Due passate più top coat. That was it! How do you like today’s nail polish? E questo è tutto per oggi! Come vi sembra questo smalto? Magnetic polish is so much fun and wish I could try more European brands. I have the Sally Hansen magnetic polishes and they always blow my mind in how much fun they are to play with. I don't why I disliked magnetic for such a long time. Maybe I had some really poor ones! I have one magnetic polish and it's pretty cool! I love the design you were able to achieve with this! I could never get magnetic polishes to work on my curvy nails. It's so awesome on you! I have curvy nails, too! I just move the magnet slightly on the sides. Ooh, it's been a long time since I used a magnetic polish! This is beautiful, the design came out really strong! Thank you Stacie! I really love how strong it is! Didn't know Douglas made these! Looks amazing.... and one coat! Yes! They changed name to their own brand through the years but I guess they now got it. I must say some of the older nail polish shades were more interesting than the actual ones though. It's a great shade. I love magnetic polishes. This one is worth looking into. It definitely is Vedrana! Thank you! Thank you Kerry! You should try some of these recent brands that do fantastic magnetic polishes!